In this artist's representation, an electron travels between two lasers during an experiment. The electron is spinning about its axis, as a cloud of other subatomic particles are constantly emitted and reabsorbed. Electrons are extremely round, and some physicists are not pleased about it. The symmetrical roundness of the electrons suggested that unseen particles aren't big enough to skew electrons into squashed oblong shapes, or ovals. These findings once again confirm a long-standing physics theory, known as the Standard Model, which describes how particles and forces in the universe behave. At the same time, this new discovery could overturn several alternative physics theories that attempt to fill in the blanks about phenomena that the Standard Model can't explain. This sends some probably very disgruntled physicists back to the drawing board, said study co-author David DeMille, a professor with the Department of Physics at Yale University in New Haven, Connecticut. "It's certainly not going to make anybody very happy," DeMille told Live Science. Because subatomic particles can't yet be directly observed, scientists learn about the objects through indirect evidence. By observing what happens in the vacuum around negatively charged electrons — thought to be swarming with clouds of as-yet-unseen particles — researchers can create models of particle behavior, DeMille said. The Standard Model describes most of the interactions between all of matter's building blocks, as well as the forces that act on those particles. For decades, this theory has successfully predicted how matter behaves. However, there are a few nagging exceptions to the model's explanatory success. The Standard Model doesn't explain dark matter, a mysterious and invisible substance that exerts a gravitational pull, yet emits no light. And the model doesn't account for gravity alongside the other fundamental forces that influence matter, according to the European Organization for Nuclear Research (CERN). Alternative physics theories offer answers where the Standard Model falls short. The Standard Model predicts that particles surrounding electrons do affect an electron's shape, but at such an infinitesimal scale as to be pretty much undetectable using existing technology. But other theories hint that there are as-yet-undiscovered heavy particles. For example, the Supersymmetric Standard Model posits that every particle in the Standard Model has an antimatter partner. Those hypothetical heavyweight particles would deform electrons to a degree that researchers should be able to observe, the authors of the new study said. To test those predictions, new experiments peered at electrons at a resolution 10 times greater than previous efforts, completed in 2014; both investigations were conducted by the research project Advanced Cold Molecule Electron Electric Dipole Moment Search (ACME). 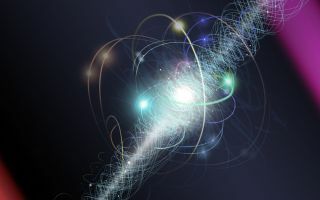 The researchers sought an elusive (and unproven) phenomenon called the electric dipole moment, in which an electron's spherical shape appears deformed — "dented on one end and bulged on the other," DeMille explained — because of heavy particles influencing the electron's charge. These particles would be "many, many orders of magnitude bigger" than particles predicted by the Standard Model, "so it's a very clear way to tell if there's something new happening beyond the Standard Model," DeMille said. For the new study, ACME researchers directed a beam of cold thorium-oxide molecules at a rate of 1 million per pulse, 50 times per second, into a relatively small chamber in a basement at Harvard University. The scientists zapped the molecules with lasers and studied the light reflected back by the molecules; bends in the light would point to an electric dipole moment. But there were no twists in the reflected light, and this result casts a dark shadow over the physics theories that predicted heavy particles around electrons, the researchers said. Those particles might still exist, but they would be very different from how they've been described in existing theories, DeMille said in a statement. While this experiment evaluated particle behavior around electrons, it also provides important implications for the search for dark matter, DeMille said. Like subatomic particles, dark matter can't be directly observed. But astrophysicists know it's there, because they've observed its gravitational impact on stars, planets and light. "Much like us, [astrophysicists] are looking in the heart of where many theories have been predicting — for a long time and for very good reasons — a signal should appear," DeMille said. "And yet, they're not seeing anything, and we're not seeing anything." Both dark matter and new subatomic particles that were not predicted by the Standard Model are yet to be directly spotted; still, a growing body of compelling evidence suggests that these phenomena do exist. But before scientists can find them, some long-standing ideas about what they look like will probably need to be scrapped, DeMille added. "Expectations about new particles are looking more and more like they had been wrong," he said. The findings were published online today (Oct. 17) in the journal Nature.